I love gnocchi and love sweet potatoes, so perfecting/veganizing this recipe was tasty and very easy. You need to try this - like most everything I attempt, it's not rocket science, I promise. I am planning to try these with a dry, slightly-starchy Hubbard squash maybe, I wonder if it'd turn out about the same? Bake the sweet potatoes/yams in 450 F oven until soft (about an hour). Peel, mash, and add cinnamon, salt and pepper to taste. Mix in flour until dough holds its shape, but do not add too much that it becomes too stiff and hard to manage. Just add until it no longer sticks to your hands - like playdough! Roll into long ropes and cut into pieces. Do the whole "rolling against a fork" thing if you must (you'll have to Google gnocchi-rolling directions) - I don't because I'm terribly inept at it, I just cut into ball-like blobs and it's fine, really. Fill a pan with lightly salted water. Bring to a boil. Cook in salted boiling water until they float to the top. Drain, saving 1/2 cup of the cooking water. In frying pan, bring water to simmer, melt in Earth Balance. Saute chard in water and Earth Balance until wilted. Sprinkle with garlic, vinegar and "chicken broth" mix. Stir well, mix in gnocchi (add additional water if it's too sticky) and serve. What an awesome flavor combination! 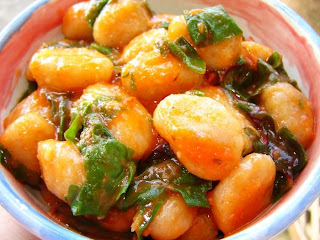 I've never seen a gnocchi recipe that didn't include some kind of egg substitute, this looks super easy and delicious. I'll definitely be trying it. I keep meaning to make sweet potato gnocchi! This looks soooo good! This is making my mouth water. I have never made gnocchi before. I might just have to give it a try. That looks really tasty. I love gnocchi, but I've never tried it with sweet potatoes. I'll have to check it out! I love gnocchi so got my yams today and tomorrow I'll give it a try!